Book hotel rooms online with us at Tivoli Carvoeiro Hotel at the lowest rate, guaranteed. Get a holiday discount room rate at the 4 Star Tivoli Carvoeiro Hotel located in the popular village of Carvoeiro in the Algarve. The hotel has 293 bedrooms providing holiday accommodation for two to four adults. 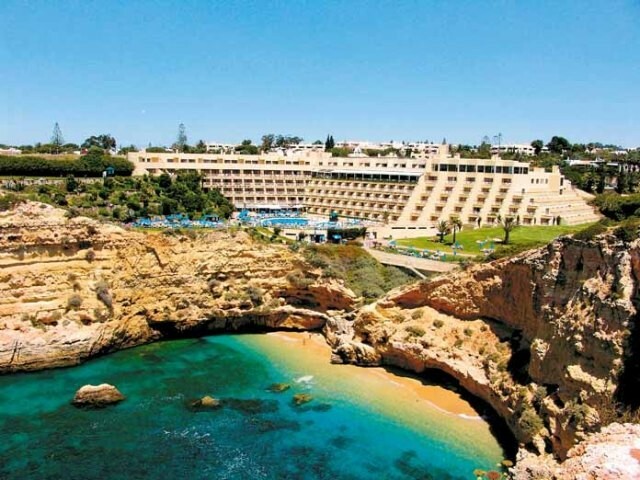 The Tivoli Carvoeiro Hotel is set just outside the village and perched looking over the ocean with a small beach below. The modern comfortable bedrooms are air-conditioned and have balconies, satellite TV, radio, direct dial phones, a work desk, a mini-bar and a safe. Tivoli Carvoeiro Hotel facilities include a restaurant, bar, a Health Centre with massage and treatments, sauna and steam baths, indoor and outdoor pools, a Fitness Centre, a Business Centre, a sauna and steam baths, two restaurants, snack-bar, bar, live entertainment in season, games room, Kids Club, two floodlit tennis courts, volleyball and a Diving Centre (PADI). There is a 9-hole golf course within five minutes and a further two 18-hole golf course in about 10 minutes drive.